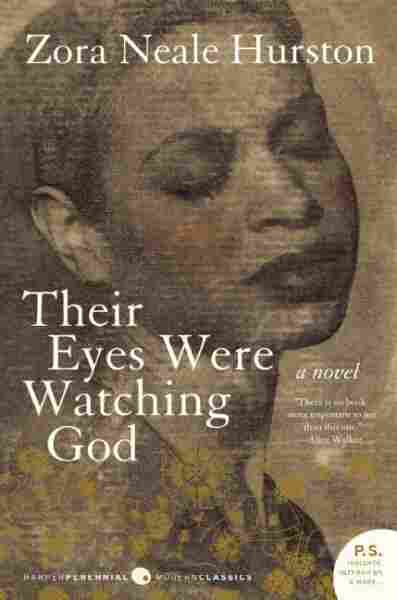 Their Eyes Were Watching God NPR coverage of Their Eyes Were Watching God by Zora Neale Hurston. News, author interviews, critics' picks and more. When Janie Starks returns to her rural Florida home, her small black community is overwhelmed with curiosity about her relationship with a younger man. Now, women forget all those things they don't want to remember, and remember everything they don't want to forget. The dream is the truth. Then they act and do things accordingly. So the beginning of this was a woman and she had come back from burying the dead. Not the dead of sick and ailing with friends at the pillow and the feet. She had come back from the sodden and the bloated; the sudden dead, their eyes flung wide open in judgment. The people all saw her come because it was sundown. The sun was gone, but he had left his footprints in the sky. It was the time for sitting on porches beside the road. It was the time to hear things and talk. These sitters had been tongueless, earless, eyeless conveniences all day long. Mules and other brutes had occupied their skins. But now, the sun and the bossman were gone, so the skins felt powerful and human. They became lords of sounds and lesser things. They passed nations through their mouths. They sat in judgment. Seeing the woman as she was made them remember the envy they had stored up from other times. So they chewed up the back parts of their minds and swallowed with relish. They made burning statements with questions, and killing tools out of laughs. It was mass cruelty. A mood come alive, Words walking without masters; walking altogether like harmony in a song. "What she doin coming back here in dem overhalls? Can't she find no dress to put on? — Where's dat blue satin dress she left here in? — Where all dat money her husband took and died and left her? — What dat ole forty year ole 'oman doin' wid her hair swingin' down her back lak some young gal? Where she left dat young lad of a boy she went off here wid? — Thought she was going to marry? — Where he left her? — What he done wid all her money? — Betcha he off wid some gal so young she ain't even got no hairs — why she don't stay in her class?" When she got to where they were she turned her face on the bander log and spoke. They scrambled a noisy "good evenin'" and left their mouths setting open and their ears full of hope. Her speech was pleasant enough, but she kept walking straight on to her gate. The porch couldn't talk for looking. The men noticed her firm buttocks like she had grape fruits in her hip pockets; the great rope of black hair swinging to her waist and unraveling in the wind like a plume; then her pugnacious breasts trying to b ore holes in her shirt. They, the men, were saving with the mind what they lost with the eye. The women took the faded shirt and muddy overalls and laid them away for remembrance. It was a weapon against her strength and if it turned out of no significance, still it was a hope that she might fall to their level some day. But nobody moved, nobody spoke, nobody even thought to swallow spit until after her gate slammed behind her. Pearl Stone opened her mouth and laughed real hard because she didn't know what else to do. She fell all over Mrs. Sumpkins while she laughed. Mrs. Sumpkins snorted violently and sucked her teeth. "Humph! Y'all let her worry yuh. You ain't like me. Ah ain't got her to study 'bout. If she ain't got manners enough to stop and let folks know how she been malkin' out, let her g'wan! " "She ain't even worth talkin' after," Lulu Moss drawled through her nose. "She sits high, but she looks low. Dat's what Ah say 'bout dese ole women runnin' after young boys." Pheoby Watson hitched her rocking chair forward before she spoke. "Well, nobody don't know if it's anything to tell or not. Me, Ah'm her best friend, and Ah don't know." "Maybe us don't know into things lak, you do, but we all know how she went 'way from here and us sho seen her come back. 'Tain't no use in your tryin' to cloak no ole woman lak Janie Starks, Pheoby, friend or no friend." "At dat she ain't so ole as some of y'all dat's talking." "She's way past forty to my knowledge, Pheoby." "No more'n forty at de outside." "She's 'way too old for a boy like Tea Cake." "Tea Cake ain't been no boy for some time. He's round thirty his ownself." "Don't keer what it was, she could stop and say a few words with us. She act like we done done something to her," Pearl Stone complained. "She de one been doin' wrong." "You mean, you mad 'cause she didn't stop and tell us all her business; Anyhow, what you ever know her to do so bad as y'all make out? The worst thing Ah ever knowedher to do was taking a few years offa her age and dat ain't never harmed nobody. Y'all makes me tired. De way you talkin' you'd think de folks in dis town didn't do nothin' in de bed 'cept praise de Lawd. You have to 'scuse me, 'cause Ah'm bound to go take her some supper." Pheoby stood up sharply. "Don't mind us," Lulu smiled, "just go right ahead, us can mind yo' house for you till you git back. Mah supper is done. You bettah go see how she feel. You kin let de rest of us know."